In case you missed this, I thought I'd share design team member, Jennifer Olek-Snyder's tutorial of this darling shaker card. She shares all the things NOT to do so you can have the perfect card the first time around. Thanks, Jennifer! 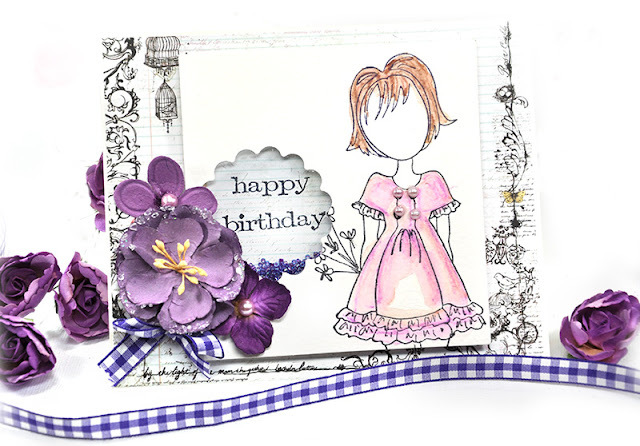 I created a few quick and easy shaker cards for Make-N-Takes and group projects featuring the Prima doll stamps created by Julie Nutting. As a result, a few folks asked me to compile some easy DIY instructions so they could use the technique for group projects as well. I made two cards - a boy and a girl card. They have different sentiments and the boy has a mat background - but otherwise the techniques are the same. If you scroll down, I share my DIY instructions as well as some pit falls and "fails" that I have overcome after some dismal shaker card attempts. I offer tips for shaker success. 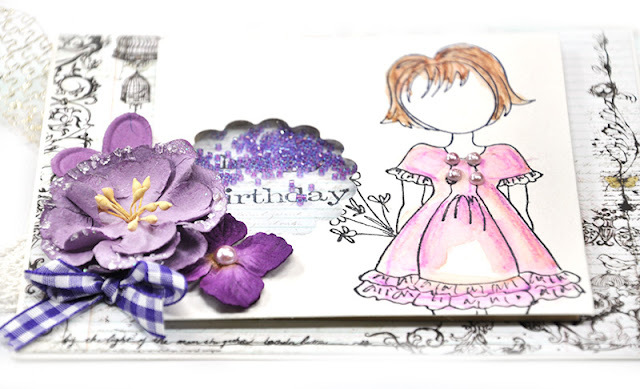 This little darling is Keira all gussied in purple and pink. Here is the sweet boy, Toby. My card is about 6.25" x 5" big. I do buy pre-folded card/envelope sets because I love the convenience. I also love having envelopes that fit. I hate trying to hunt down envelopes for irregular sized cards. Step 1. I knew I wanted to use watercolor pencils for my card so I used watercolor paper for the window and doll stamp. I cut a piece of watercolor paper to fit my needs. 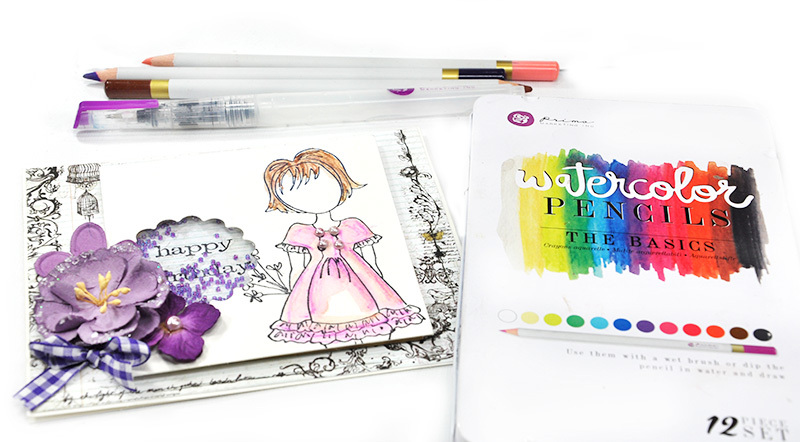 I do think watercolor paper works best when using watercolors. 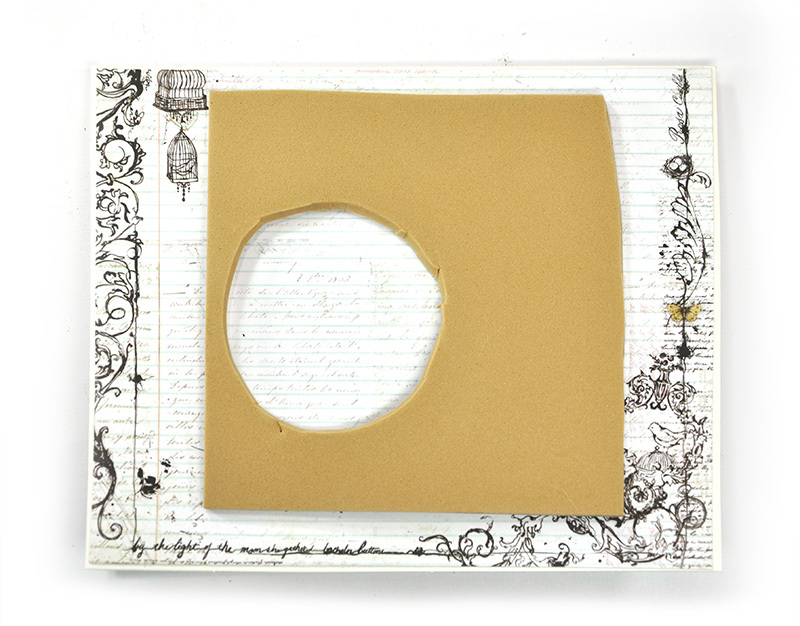 The paper doesn't rip and tear when it gets wet as patterned paper or cardstock may do. I punched first then I stamped the doll image. 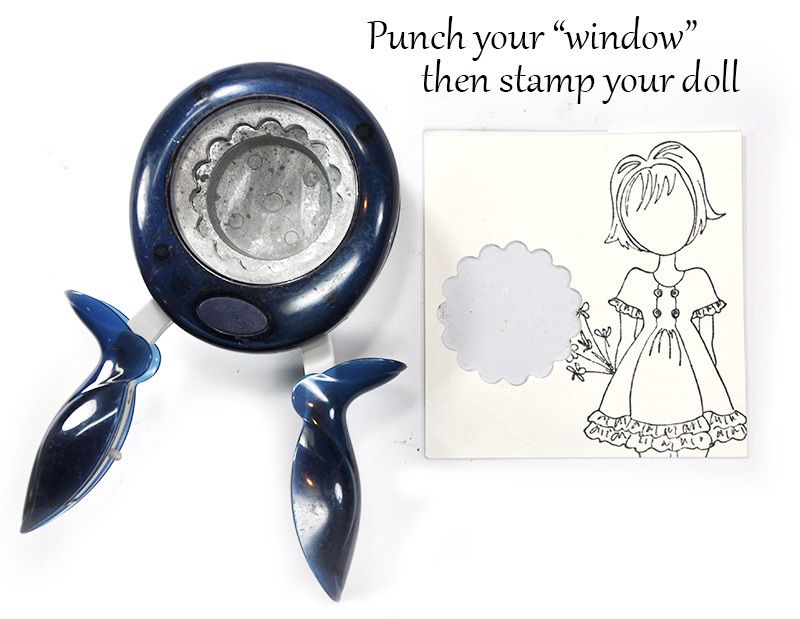 The punch was first because then I could determine exactly where to add the stamp. I tried stamping first and the poor sweetheart lost an arm. Step 2. Every shaker card needs a "sandwich layer". I found that Fun Foam makes for great sandwich material. 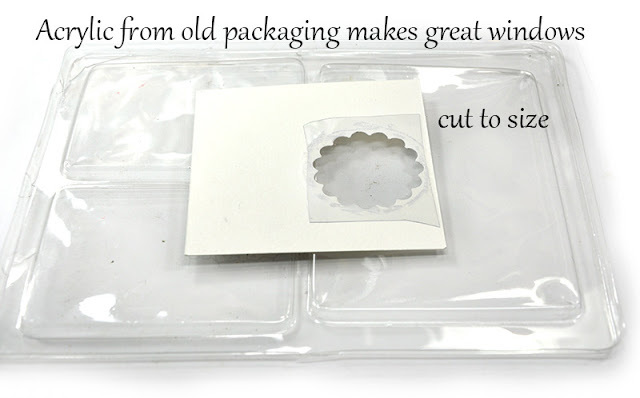 It's super easy to cut, light weight, has a consistent flat surface and is very inexpensive. So why didn't I use cardboard? Well I tried a shaker card using cardboard. Ya know those cool little tunnels in the corrugation of the cardboard? Well, they become less cool when the beads and shaking material fall out of the tunnels of the cardboard onto your floor. An empty shaker card looks ridiculous. So why didn't I use foam tape? Many reasons actually. Foam tape is much more expensive than a sheet of Fun Foam. With my window being more circular, it's so much harder to create a good seal with foam tape so that shaker material doesn't fall out. I need to use a lot of foam tape to cover the surface of the card and provide support. If I do not have a flat surface for the top layer, I may get dips and ripples in my top layer. Man I hate dips and ripples in my cards. Hate that! Plus I am too cheap to waste all that foam tape. Step 3. I used the punched window as a template for tracing onto the foam. 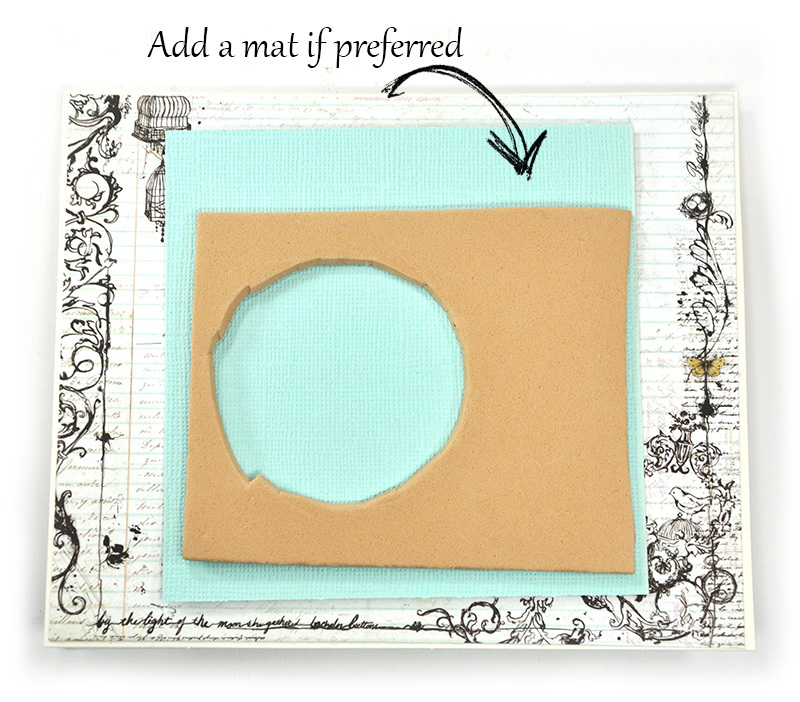 Do not add the window to the card until you create your foam template and know where to cut the foam. Yeah - I've messed up a few times and glued my window to the card before tracing. Let's just say I am not good at guessing where to cut the perfect hole. haaaaa! Good thing Fun Foam is cheap. 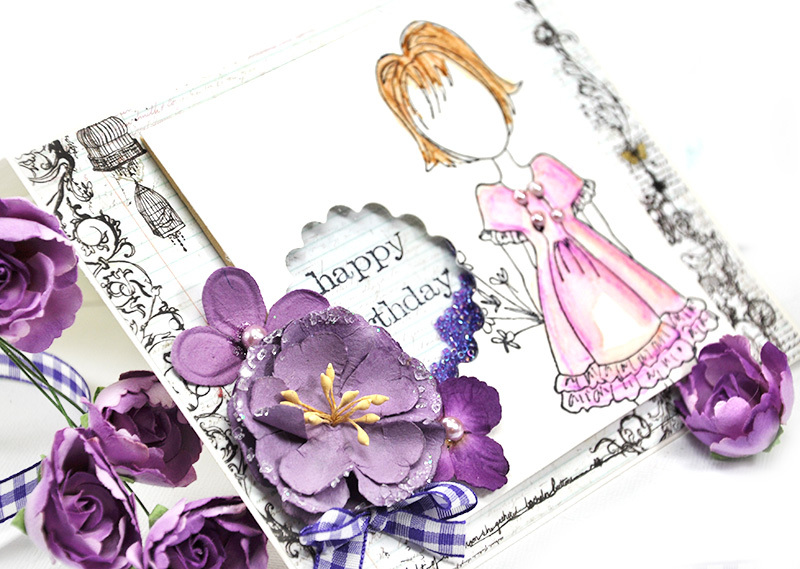 Another tip....if you are making a bunch of these, it's usually best to custom cut the foam for each card. Unless your punching is spot on perfect for every card, you are going to run into foam problems. Once again...I appreciate the fact that Fun Foam is cheap after 5 cards for Make -N-Takes didn't fit properly. Step 4. Cut the foam bigger than the traced lines. Now is not the time to bother with perfection. No one will see the foam underneath. Step 5. Glue the foam to the base layer of the card. Make sure you have added a sufficient amount of glue around the circle of the foam. 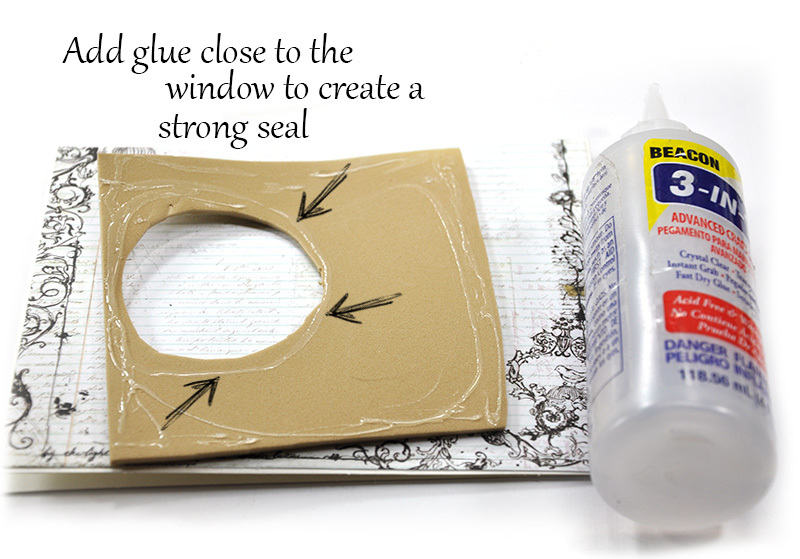 You need to create a good seal so you do not lose your shaker material. I like using a strong durable glue that works well with many surfaces. I am using Beacons 3-in-1 glue. This also dries crystal clear. It really is remarkable. My shaker card "fail" and my tip for success: Do not try outsmarting the Fun Foam by pulling out your glue gun and using it to adhere the foam to the card. The foam will have the last laugh and you'll be thankful Fun Foam is cheap. haaaaaa. 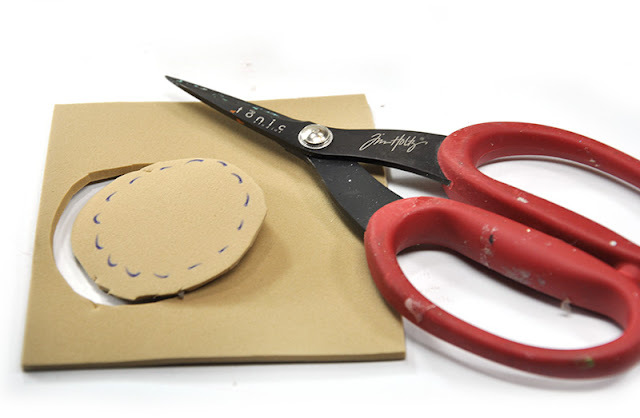 The foam does melt and warp when using the heat gun or hot glue gun. I've done it. And yes.....I was thankful Fun Foam was cheap. Step 6. Now you can add anything you want inside the window. I added glass beads. You can add sequins, trinkets, crystals, and anything that moves freely. Is glitter ok to use? You can certainly add glitter but it does have a tendency to stick to the acrylic window from static. When I used glitter for the first time, all I saw was the glitter. It stuck to the acrylic like a glitter blizzard. I just could not get it to shake off. 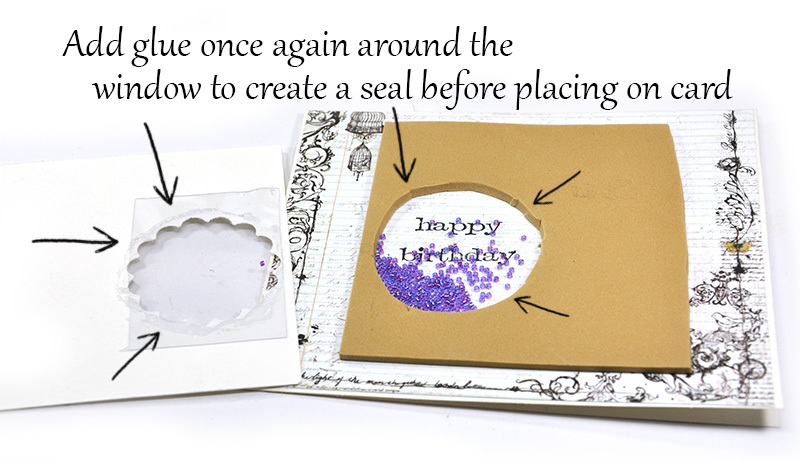 You can wipe the acrylic with an Embossing Buddy (a little pillow filled with a cornflour like substance to remove static from cardstock). You can also wash the acrylic with soap and water which will help. I'm too lazy to do either of those so I pick shaker material that I know will shake. Step 7. Now's the time to find some acrylic for the window. I love to save acrylic from packaging. Sometimes embellishments come with an acrylic package. I save everything with acrylic; produce comes in acrylic ( lettuce, strawberries, tomatoes...whatever), baked good come in acrylic (YUM), below was a CD set that came in wonderful fabulous reusable acrylic. I save it all! Step 8. Once again, I pulled out my strong glue because I know it will hold my acrylic in place. Add glue all the way around the window to create your seal. Step 9 Attach your window to the card. 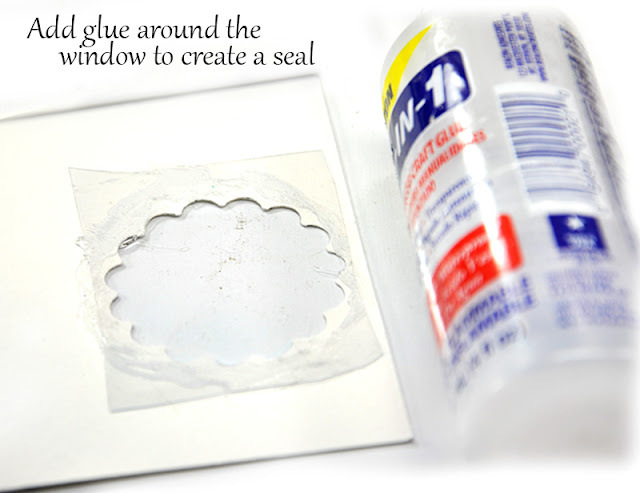 Add glue around the window to create a secure seal. Warning Warning Warning...add your shaker material before you close up the window. While that should be absolutely obvious, this remains the single hardest step for me to remember. I cannot tell you how many times I have closed up an empty shaker card. sheesh. I tend to get so excited that I am just about finished that I plumb forget to add the beads. I'm just telling it like it is. 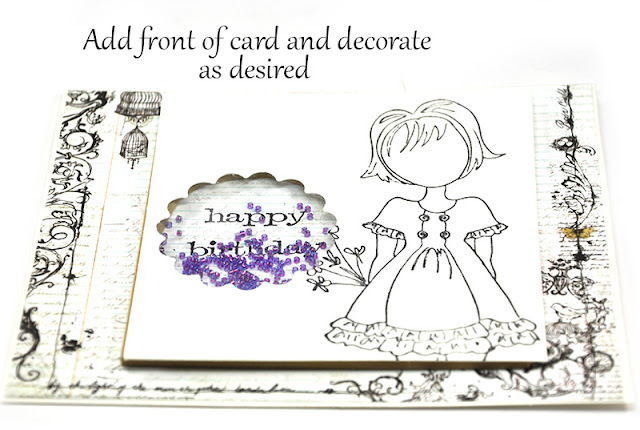 Step 10 Decorate your card as you wish. Step 11 I used Prima's watercolor pencils and waterbrush to add pops of color to my doll stamp. I also added Prima flowers and a pretty gingham ribbon. And here are a few more photos of the successful shaker cards. Thanks for stopping. I treasure your support and comments. 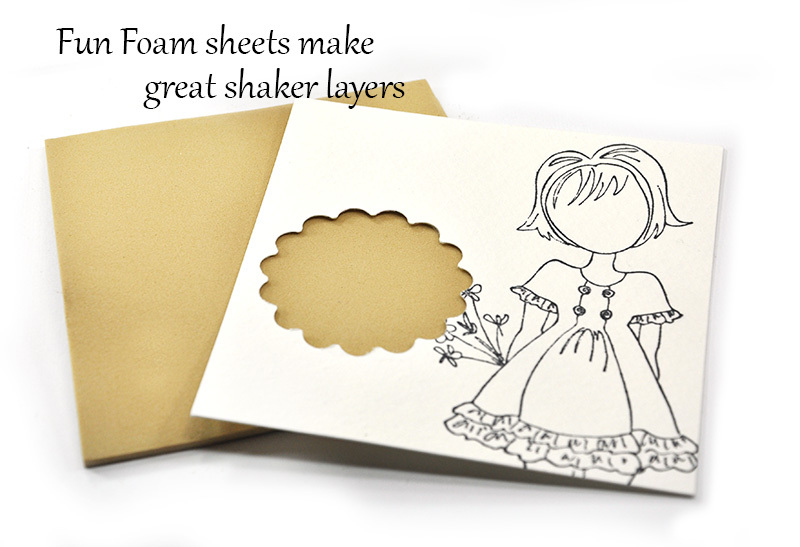 Great tips and love these shaker cards!! Love the cards. Thanks for the tutorial on how to make the shaker....I must try it. HI Jen...thanks for the tutorial and all your tips!! Love the cards!! You are so pleasantly funny I enjoy so much your tutorials and videos. I can take a deep breath and know I don't have to be perfect in this craft. Plus I can laugh at myself when I fail at my try's. Thank you for your honesty and the fun you put into creating. Hugs ~~ Mary L.